FREE eBook on Preparing for Job Interviews! Hey all! I hope everyone is having a wonderful day off for Labor Day! 🙂 I just wanted to share some exciting news with you. I won’t bore you with a long post, so let’s get right to it! 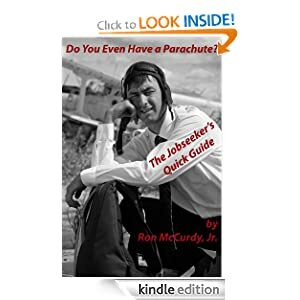 My dad, Ron McCurdy, recently published his own ebook “how to” on preparing for job interviews and getting a job. It’s called Do You Even Have a Parachute? : The Job Seeker’s Quick Guide . This book as the ultimate resource for job hunting, just as a parachute is the ultimate resource for skydiving. The goal of this book is not to give you a hundred or so pages to read through in order for you to be prepared to find a job or career. The goal is to give you a condensed version of the valuable details you will need to be the best one for the job. It’s something you can carry with you and, right before the interview, brush up on fine points. In this economy, this book can be a gem if you’re trying to get a job! And the really exciting news I wanted to share with you today is that this book is available for FREE today! You can get it right here for FREE! It’s for today only, so make sure you take advantage of this great deal and keep it in your Kindle for when you are getting ready to go into a job interview. It might help you land that job that will support your family! That's exciting! How neat. I did download the book and will put it to use. How is your WIP coming? Caitlyn – Great, hope you enjoy! !